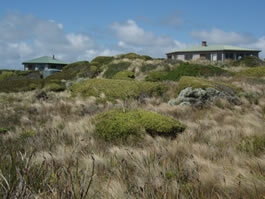 Two self contained one bedroom shacks on the Wild west coast of King Island, open fires and Zen baths overlooking the ocean close to Currie. Suits adventerous golfers, surfers, dreamers and explorers. Owned and operated by potter & artist Caroline. Selected as one of the best 54 Getaways in Australia as seen on TV. Totally private 'Waterwitch' , and 'The Gap', both have fully equipped kitchens, Rock open fires, TV, CD, video plus a record collection, books, linen, hair dryer. New linen etc for the queen bed but bring your own if you wish. A 15 minute walk to Currie via the beaches, although I would advise a car hire. Ring me on my mobile 0429 621 180 or email me as I may be painting or at the boathouse or beach. $150.00 double a night. 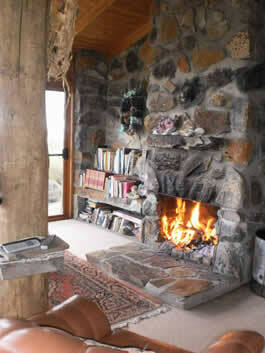 The houses are warm, and full of King Island's beach combing delights. For more detail see Devils Gap and Water Witch pages. Wild Thing is also available. This house is situated in the central King Island region and is surrounded by a magnificeint garden and offers peace and tranquility.